Escalating violence in Syria since 2011 has caused damage to numerous historic buildings, tell mounds and archaeological sites. illegal excavations and looting have also exponentially increased since the beginning of the conflict in Syria. These actions have damaged many historical sites and museums, and important Syrian cultural property has disappeared from the country to end up on the black market and/or in private collections. In order to preserve and to make the visual documentation of the cultural heritage in Syria accessible to the public, the NPAPH project is gathering and digitizing material for the NPAPH Syria Archive. 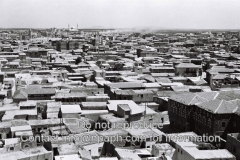 This archive includes locations such as Tell Brak, Hama, Halabiye, Resafa and Tell Halaf. We have made every attempt to ascertain the authorship of a given picture. Should a copyright not be acknowledged properly, we would be grateful if owners of these images contact the website owner so that correct acknowledgements might therefore be made. Should you object to your personage appearing in a given photograph, please contact us and we will endeavor to clarify this matter further.